Android Pay is finally here and it's pretty much everything we expected it to be. While there are plenty of questions about where we can use it, which credit cards can be set up, and why it's so aggressive with brightness even when barcodes aren't on screen, the actual act of spending money is about as straight-forward as it could be. As it turns out, there's one feature Google hasn't really discussed yet, but it could become the best thing about using a phone to buy things. Android Pay can automatically redeem special offers, submit account details for loyalty programs, and make a payment in just one tap to a payment terminal. We first discovered evidence of auto-redemption during a teardown of the Android Pay app. Later in the day, a post on reddit by condor85 confirmed that the feature was already operational. 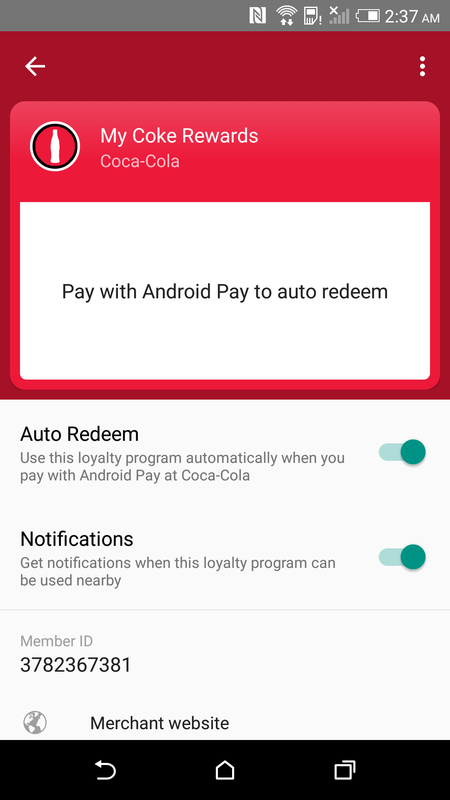 To get things rolling with Auto Redeem, users simply have to go into the app to set up their loyalty program account details. When they begin a transaction, the app will automatically check for the appropriate account and seamlessly submit it along with the payment info. Only one account can be submitted per store. Here are the strings, for those that would like to take a look. Note that the name "SmartTap" is used for a couple of notifications. Details about the use of coupons and special offers aren't so clear. Only one line mentions offers, and only in the context that they will be usable with Android Pay. We'll have to wait a bit to find out if there are any limitations. Auto-redemption seems like a feature we should have had long ago with Google Wallet, and in fact, we did. Back in 2011, Google announced SingleTap, a collaboration with eight other companies to enable the use of automatic coupons and reward programs during checkout. The initial partners included: American Eagle Outfitters, Foot Locker, Guess, Jamba Juice, Macy's, OfficeMax, The Container Store, and Toys "R" Us. Auto-redemption did actually work for a while, but it was quietly shut down at a later date for reasons that were never fully discussed. Messages shown in the card stack (left) and full view (right). Note: The account number is not real. There may be a pretty good reason Google hasn't been promoting auto-redemption yet: it seems there simply aren't very many partners supporting it. In fact, after testing out far too many rewards programs, the only one I've been able to find that offers this feature is My Coke Rewards (pictured above). Even the partners from the SingleTap venture don't seem to be compatible, nor are any of the prominently featured companies like McDonalds or Whole Foods. This is probably the sticking point that keeps Google from talking about a one-tap experience, possibly now known as SmartTap. Once there are some new companies joining in, we can probably expect some fairly energetic marketing to get the word out that. Auto Redeem could become the driving force behind adoption for mobile payments. 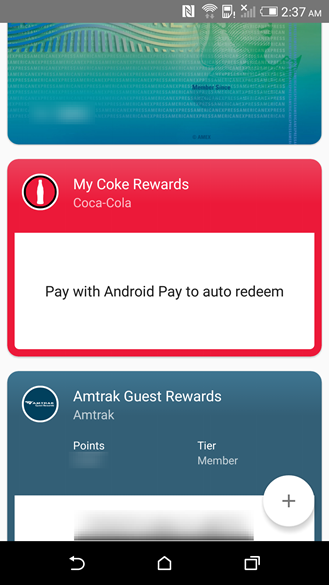 If I'm being honest, I'm probably not going to use Android Pay very much after the novelty wears off; a regular credit card is still less work. On the other hand, I'm far more likely to use a phone to deal with membership cards, and once I've got my phone out to claim those rewards points, it becomes easier to keep using it than to reach for a credit card. This may sound simplistic, but it could mean the difference between success or failure for mobile payment solutions like Android Pay.